Subversion (SVN) is a free open source revision control system. Unlike git, SVN is a centralized system that requires a server. With this package you can perform some of the most common SVN functions directly from within Vedit text editor. This makes it easy to perform the functions on the file you are editing, and to easily perform some operations that would require cryptic commands when using the command line tool. The macro has been tested with Vedit 6.24, but it should work with older versions, too. However, some of the functionality (such as double-click) require Vedit 6.21 or later. See below for description of each file in the package. Status - Displays list of modified/added/deleted files that need to be committed. Info - Displays information about the working copy paths or URLs specified. Log - Lists commit log for current file, directory or repository. Diff - Compare different versions of a file or directory. Revert - Discards changes in the work file and fetches current version from repository. Commit - Commits all modified files into svn repository. Update - Brings changes from the repository into your working copy. Options - Displays Options dialog. 1) Button [Add], [Remove] or [Undo] is shown depending on whether the file is already on repository or not, or if the file is scheduled to be added or removed. Files - Displays list of files modified in the selected revision. Get - Get the selected revision of the file from repository to your local disk. Opens a window to display current commit status. Lists files on your working directory that have been modified, added or removed since the last commit, and files that are not in repository. If you double-click on a filename in this window, that file is opened for edit (requires Vedit 6.20 or later). Note: You can use ignore list to specify files that you do not want to be shown in this list (e.g. *.obj and *.bak files) using ignore list. See Options dialog. Opens a window to display information about repository path, working copy path, revision, last change date etc. (svn info). Lists commit log for the changes on the current file (or file selected from status display) / current dir / all files in the repository. Messages only - displays commit number, committer, date, number of lines changed, and commit message. show diff - in addition to the above, shows the actual changes made to each file in diff format. Only show commits in the current branch. If not checked, lists changes done before branching, too. "List commits for" selection defaults to "File". Other options are remembered if you change them. Click OK to create the log listing. A new window opens to display the log with syntax highlighting. - Some of the buttons in main dialog are different (see above). - If you select Diff while the Log display is active, you can choose diff for selected commit (See Diff below). from Revision - You will be prompted for first commit number. Compares two revisions of files with diff algorithm and creates list of changes between the revisions. Workfile to last commit - Compare file(s) in your working directory to the head of repository. Last commit to its Parent - Compare last commit in repository to its parent (previous commit). If you call svn diff while svn_log.tmp is the active file, you have an option to choose an earlier commit from the list. Move cursor anywhere on the description of the commit you are interested in and call svn diff. Now you have additional options to compare your work file to selected commit, or to compare selected commit to its parent. You can even compare any two revisions listed in the log display. First highlight a block anywhere in the description of the first (older) revision you want to compare (for example the commit number). Then move cursor to the second revision and execute svn diff. Now you have yet another option, "Compare Selected revision to Highlighted revision". 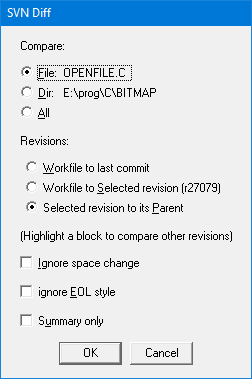 Workfile to selected revision - Compare the file(s) in your working directory to the revision pointed by cursor. Selected revision to Highlighted revision - Compare the revision pointed by cursor to the revision where a block is highlighted. [ ] Ignore space change - If number of spaces (e.g. indent level) has been changed, that change is not shown. [ ] ignore EOL style - CR, LF or CR-LF change is ignored. The diff results are displayed in a new window with syntax highlighting (so you can clearly to see which lines have been changed, added or deleted). If you double-click on a code line in the listing, the corresponding file is opened and the cursor is moved to corresponding line in your work-file. 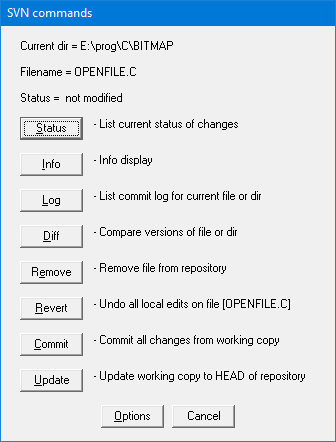 Which button of these is displayed depends on whether the file is already on repository or not, or if the file is scheduled to be added or removed. Add button schedules the current file (or a file selected from Status window) to be added to repository on next commit (svn add). Remove button is displayed if the file is already in repository. The file will be removed from repository on next commit, but it will remain in your workspace. (svn delete --keep-local). Undo button is displayed if the file has been added or removed but not yet committed. This option undoes the Add/Remove operation. (svn revert). Discards changes in the work file and fetches current version from repository (svn revert). Note: The file date will be restored to original date. Thus, if you want to re-compile the code, you may need to execute "Build All" or equivalent command in your development environment. This function is available when you call svn.vdm from Log display window. Displays list of files changed on the selected commit. To select the commit, move cursor anywhere in the description of the commit (on the commit line or below it), then call svn.vdm and select [Files]. 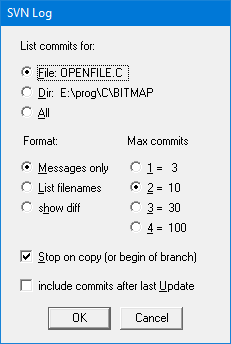 The file list is opened in a new window, together with the commit description. You can double-click on a line containing filename to open that file. If you call svn.vdm while the file list is open, the svn commands (such as diff) are targetted to selected filename and revision. This function is available when you call svn.vdm from Log display window. It fetches the selected revision of the current file. A dialog box opens for selecting the location where the file will be stored. You can choose either current files directory or VEDIT_TEMP directory. The filename for the fetched file is combination of revision number and the original filename. For example, if you fetch revision 123 of the file main.c, the fetched file will have name r123_main.c. The file is automatically opened for edit. Updates all modified files from your working directory into svn repository. A second instance of Vedit opens for entering the commit message. Status of changed files is listed as comments (the comments will not be included in commit message). You can type one or more lines of text. When done, close this instance of Vedit and answer "Yes" when prompted to save the changes. If you leave the commit message empty (the message contains only comments), the commit is canceled. After the commit has been performed, a message window is displayed at the bottom of screen. The window is green on success and red if there were any errors. You will have to close this window manually after reading the message. Brings changes from the repository into your working copy (brings your working copy up to date with the HEAD revision). A window opens to display the response of the command. It lists the files modified. The character before the filename indicates the action taken: Added (A), Deleded (D), Updated (U), Conflicted (C), Merged (G), Existed (E). Opens Options dialog for editing some Subversion settings. Clicking a button on Options dialog opens one of Subversion configuration files for editing in a new Vedit instance. After editing the file, exit the Vedit instance and save the file if you want the settings to be stored. Global Ignore - Opens Global-ignore list for editing. Here you can list the filenames, filters (e.g. *.obj) and directories that you do not want to be added to repository. Global ignore list affects all your svn projects. Ignore - Opens local ignore list for editing. Local ignore list only affects files in your current svn repository. Config - Opens Subversion global Config file for editing. This file contains the settings you can set with svn config commands. Some of the settings are already set by svn_setup.vdm if you ran that when installing the svn integration. svn_dclick_diff.vdm - implements double-click on the svn diff window. Double-clicking on a code line opens (or switches to) the corresponding file and moves cursor to the line specified by the line number (in the current version of the file). The package contains syntax files to add some color to each of the listings. The syntax highlighting is automatically activated if you copied the supplied filename specific configuration files (*.CFN) into your config directory (see Installing Svn Integration below). - lines from new version (added lines) are shown as green. svn_log.syn provides syntax highlighting for Log listing (svn_log.tmp) changed files list (svn_files.tmp) and commit message entry (svn-commit.tmp). svn_status.syn provides syntax highlighting for Status display (svn_status.tmp). svn_config.syn provides syntax highlighting for svn configuration file. The package contains .CFN files for each output file type. The main purpose of these packages is to automatically enable color syntax highlighting. These files should be moved to your file-cfg folder. This can be done with svn_setup.vdm macro below. You must already have Subversion installed in such way that you can enter svn commands from DOS prompt. To install and configure Subversion, see svn documentation (check the links below). To install this svn integration package, unzip the files into your user-mac directory. Move filename specific configuration files (*.CFN) to your file-cfg folder. Set Vedit as svn default editor (used for entering commit messages etc.). On Log, the revision that was last updated from repository is marked with 'R'. Svn Book - On-line version of the book Version Control with Subversion. Learn to use svn.